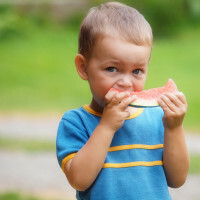 Home » Nutrition » Healthy Eating » What Kids Eat Today Prevents Cancer Tomorrow! Approximately one in three cancers could be prevented if we all ate smarter, moved more and weighed less, according to the American Institute for Cancer Research (AICR). But achieving that goal will be difficult, because so many of us learn unhealthy habits in childhood. SuperKids Nutrition has teamed up with AICR to create recipes, games and activities to show parents and kids how healthy foods can taste great and that being active can be fun! Here are 3 tips for your family to start preventing cancer today! 1) Eat Powerful Plant Foods – Choose a variety of fruits, vegetables, whole grains, beans, herbs and spices! Plant foods have super colorful compounds that work to shield your body and your KIDS’ bodies from bacteria, germs, viruses and diseases like cancer and heart disease. Use the Super Crew Shield Tracker to make sure you’re getting enough colors in your diet to shield your family from cancer. 2) Make it fun – Read, play and learn about fruits and vegetables together in a fun way. Go on a healthy food scavenger hunt at a farmer’s market or your local grocery store, conduct a family cooking competition in your own kitchen or plant a small vegetable or herb garden. Have some fun! Our tool kit has tips on getting kids cooking in the kitchen. Teaching kids to cook, even if it’s just once a month helps develop independence, organization and the ability to follow directions. Plus they’re more likely to eat what they make! Learn more about cancer prevention and make a pledge to start preventing cancer today! Comment on What Kids Eat Today Prevents Cancer Tomorrow! I thought these were awesome tips and I’m excited to see the games and recipes created by AICR and SuperKids Nutrition. I think understanding the balance between lifestyle factors, such as nutrition, and genetics in preventing cancer no matter the age is an interesting topic. I definitely agree it’s important to start healthy habits young to increase the chances of a healthy lifestyle in adulthood! This is so true. I wish more people understood this. Melissa, I love how you are teaching others about this important issue. My husband and I love helping and encouraging families towards a “real food” healthy lifestyle, so we will be sharing a lot of your posts. Keep up the good work!